Once again I found myself starring at some very sad looking bananas on my kitchen counter. I was extremely tempted to make more banana bread with vanilla brown butter glaze, but I decided to try something new. This bread to a real treat. It is super moist and has tons of banana and Nutella goodness!! I used whole wheat flour because that is what I had on hand. Plus, it makes me feel a little better about all the Nutella..LOL. 2. Prepare 8x4" loaf pan with non stick spray. 3. In a medium bowl mix flour, baking soda, and salt together. 4. In a large bowl cream butter and sugar together, with an electric mixer. 6. Add banana, milk, and vanilla. Mix until blended. 7. Add flour mixture to your banana mixture, and stir until just blended. 8. Place Nutella into a small microwave safe dish. Microwave the Nutella for 15 seconds. 9. Add 1 cup of your prepared batter to the Nutella and mix well. 10. Alternate spooning the Nutella batter and plain batter into the prepared loaf pan. 11. Swirl the batters with a knife. 12. Bake for 50-60 minutes. It will seem a little undercooked, but that is ok.
13. Cool for at least 15 minutes in pan, then turn out onto a wire rack and cool completely. My two favorite things all wrapped into one! I am trying this...tomorrow? :) thanks for sharing. Love this! I was following until steps 9 & 10. Do I add one cup of the prepared batter to the microwaved nutella then add a cup of this mixed batter to the prepared batter until I'm done with all of it? 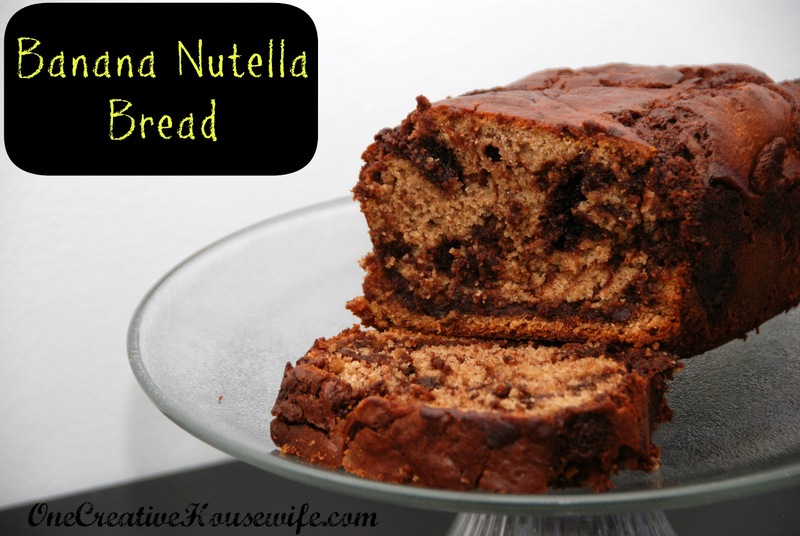 You want to add 1 cup of the banana bread batter(Batter 1) to the heated Nutella. This makes batter 2. Then you want to spoon the remaining plain banana bread batter(Batter 1) and Nutella batter mix (Batter 2) in to the bread pan. In your bread pan it will be kind of layered.